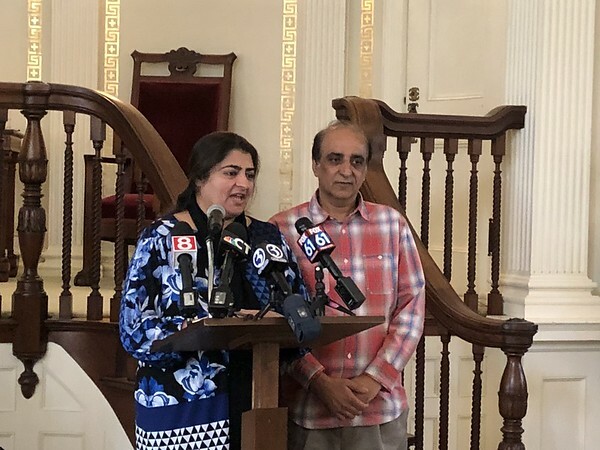 OLD LYME - It was a time to celebrate on Tuesday at the First Congregational Church of Old Lyme, as Malik Naveed bin Rehman and Zahida Altaf finally left the the building after having taken sanctuary there for months. “Thank you all so much; I love you and I’ll miss you,” Rehman told members of the congregation before entering a vehicle headed to Hartford. Rehman and Altaf, New Britain residents and owners of a city pizzeria, were on their way to Hartford to personally thank Immigration and Customs Enforcement officials for not opposing their pending request for a stay. The couple took sanctuary at the church in March after ICE told them they had been scheduled for deportation to Pakistan. Now, with new legal representation, the couple has another chance to remain in the country. “Over the past seven months, it has sometimes felt as though this day would never arrive. We dreamed about, we hoped for it, we prayed for it, but the days were often long and the nights were longer,” said Senior Minister Steve Jungkeit. Jungkeit and his congregation are a welcoming presence to undocumented immigrants facing deportation, and the church has helped people before. Last year, New Britain resident Mariano Cardoso Sr. spent a night in the church to avoid deportation. Rehman and Altaf came to the United States from Pakistan in 2000 on visas, moved to Canada briefly, then settled in New Britain in 2005. Rehman had worked in pizza shops for many years, and in October 2017, he bought Pizza Corner on Broad Street. After living in the country for more than a decade, assuming their lawyers were helping to extend their visas, they were contacted by ICE and told that there were problems with their legal status. Roniya, the couple’s 5-year-old daughter, was born in the United States and is legally a citizen, but the couple did not want to split their family by leaving her with someone in the U.S. while they were deported. The couple said they’ve gone through several lawyers, each of whom has given them conflicting information about their legal status. Just when they thought they had everything in line, they said, another lawyer would tell them something different. 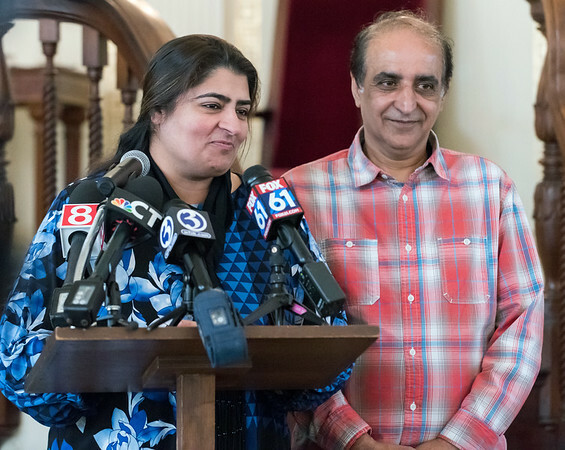 Threatened with deportation, Rehman and Altaf turned to the church, which offered them sanctuary to give the appeals process a chance to work and give the couple an opportunity to plead the injustices of their case to the courts. 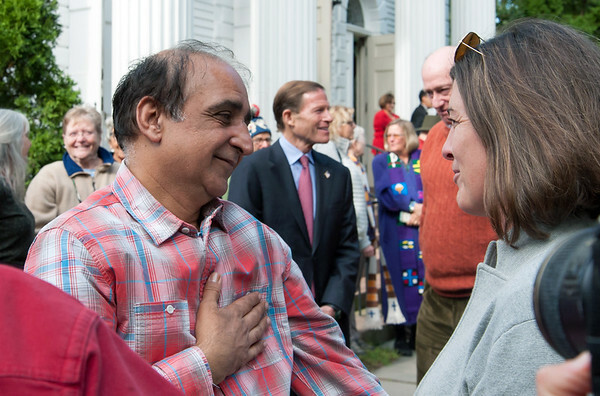 Altaf gave a special thanks to the congregation, particularly Lina Tuck, chairwoman of First Congregational’s Immigrant Assistance Committee. Altaf also thanked New Britain Mayor Erin Stewart and the Common Council for their support. “The way you treated us made us strong,” Altaf told Tuck. After his wife spoke, Rehman was speechless for a few moments. “Seriously, thank you all,” Rehman said. Blumenthal gave an open initiation to the congregation and others to enjoy pizza at Pizza Corner at 11 a.m. Thursday, Oct. 18. While Tuesday was a step forward, Rehman and Altaf aren’t in the clear yet. “Today is a relief, it’s not a victory,” Attorney Glenn Formica told reporters Tuesday outside the First Congregational Church of Old Lyme. About three weeks ago, Formica filed an appeal of the denial of stay from the Board of Immigration Appeals. He also filed a separate request for a stay during the appeal process. ICE recently announced it would not be opposing the stay request, which is pending in the 2nd Circuit Court of Appeals. Malik and Zahida are awaiting a ruling from the courts on whether their full deportation case will be reopened. These cases typically take about a year for a ruling to be made. Formica said he thinks, based on the couple’s history with fraudulent attorneys, they have a good case and is confident their situation will be resolved. During their stay of deportation, the couple’s legal counsel will help them pursue their efforts to obtain legal status in the United States. Posted in New Britain Herald, New Britain, State on Tuesday, 16 October 2018 21:24. Updated: Tuesday, 16 October 2018 22:19.